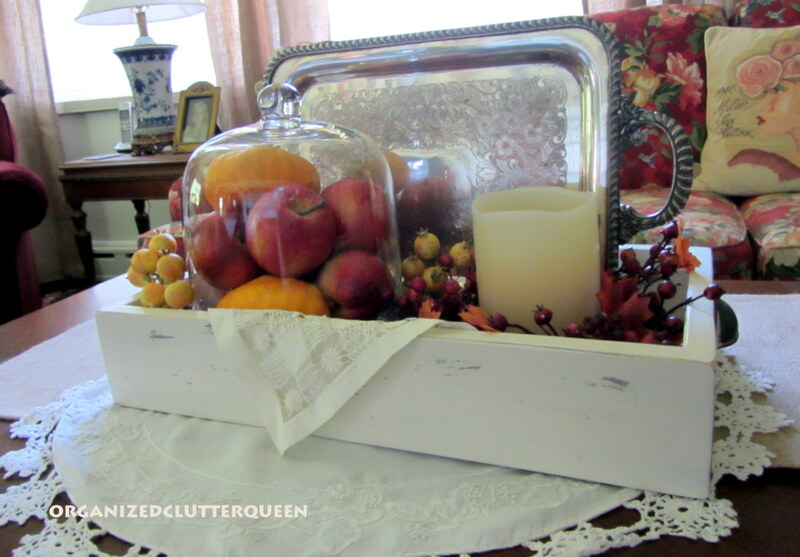 I worked on an autumn coffee table vignette today. It started with finding some orange mini pumpkins at the Dollar Tree. Of course they look a little fakey, (they cost a dollar), but decorating this early and while it's this hot, I worried that real, mini pumpkins may get moldy. Here is the the Dollar Tree pumpkin on the left, just as I purchased it. The one on the right has been touched up. The original is just too bright orange and too shiny. I squeezed a little blob of Walnut Noyer Ceramcoat acrylic paint on a paper plate and watered it down quite a bit. I then took a half sheet of paper towel, scrunched it up and wet it a little. Then I dipped it in the watery walnut paint. I dabbed the pumpkin on and off until the paint was not too dark. 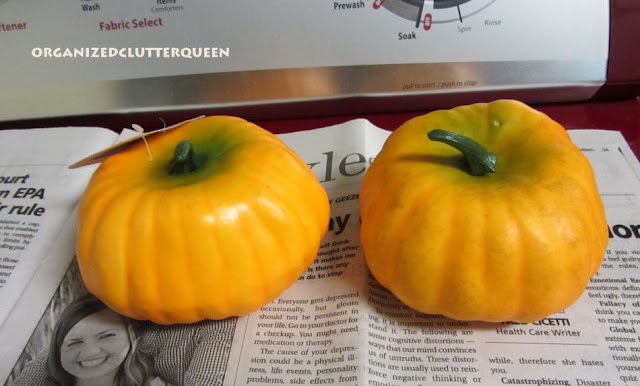 The pumpkin has a sort of mottled look like real ones that are a little green and dirty from being just picked. This is not as easy to see by the photo, but the stem was solid green and plastic. I took yellow paint and watered it down too and dabbed and rubbed it into the stem grooves to give it a yellow and green look like the real mini pumpkins that I have here. I had this burgundy/dark red and orange candle ring from last year and a flameless candle that I put in the painted, distressed wood box. 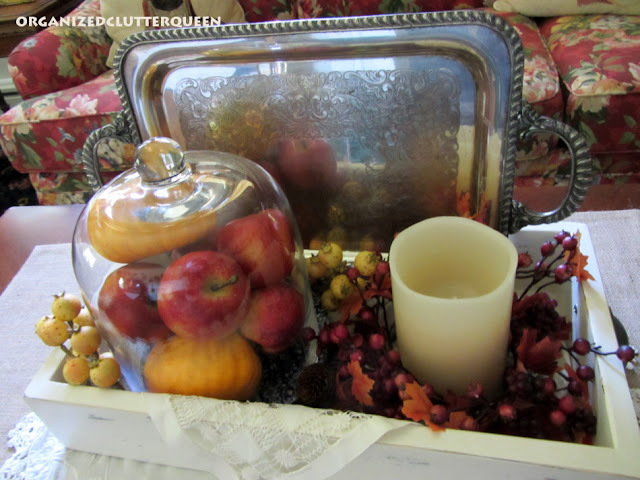 I then added some more expensive faux apples (not Dollar Tree more like $3.95 each or more) to a cloche along with two of my touched up Dollar Tree mini pumpkins. Lastly added a few faux berries and pine cones, and a silver plate over copper, rectangular tray I found last month. I have a burlap runner under a white cotton lace edged vintage oval runner and a vintage square linen in the box. It was 90 here yesterday and 80 something today. It doesn't feel like fall but according to the calendar, I guess it's close enough! How cute! 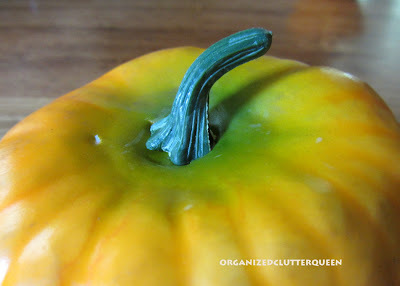 You should stop by my blog tomorrow and submit to my new photo meme, "Orange You Glad It's Friday" Hope to see you there! 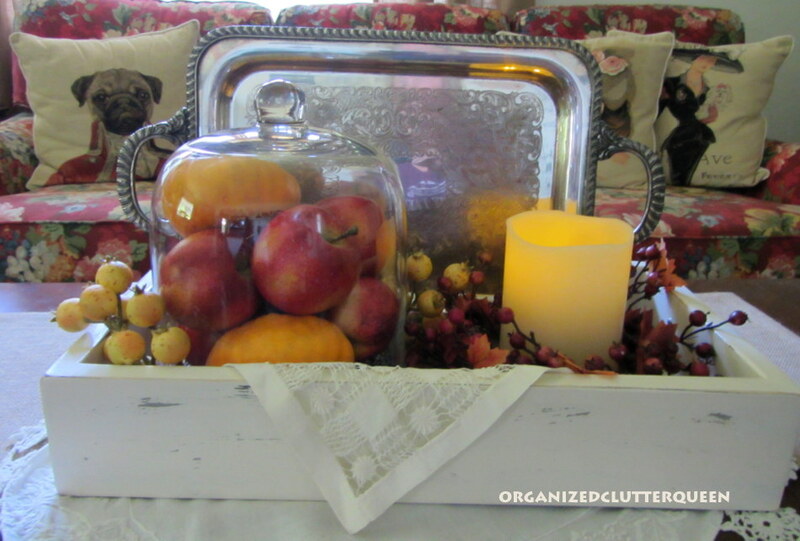 Carlene, I LOVE your Autumn vignette!!! The little box is perfect with all your goodies inside. The tray is the perfect back drop for everything. Thanks for the inspiration. I really need a pretty cloche like that!! Your tray is pretty....I told my hubby to get me my harvest tubs from storage next week....I am ready to Harvest-ize!! This is such a pretty fall vignette! I love the silver tray and when the candle is lit, it gives off such a warm glow. Super job! Thank you for sharing your charming project at Potpourri Friday! Hi Carlene - love the Autumn table. I am getting in the mood to Autumn-ize pretty soon too! 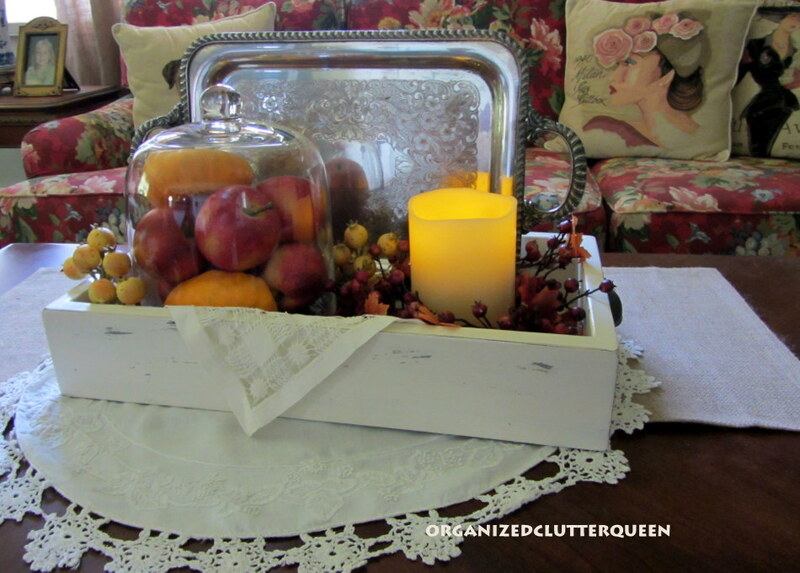 Oh, Carlene, I love your fall table and vignette, you inspired me for making a tray fall vignette later on. I'm loving how you did the little pumpkins, I thought they were real at first glance, lol.. Beatiful back drop too and I just peeked a pretty pug pillow in your couch too, as I have pugs in my heart, cause two years ago we lost our 13 year old pug Ben and I still miss him so much! Thank you for your lovely visit, I love it when you do. Enjoy your weekend. Pretty! I never thought about "fixing" plastic pumpkins! I think I'll go to Hobby Lobby and look for some and use an antique wash. Great idea! Thanks! Love your arrangement! We don't really have fall here so it's fun to see everyone getting in the mood for it. I love what you did with your vignette. It was so hot here today too. I was outside sanding furniture and wood pieces and I got pretty burned. A day of sweat and accomplishments. Hope you had a good day and have a wonderful weekend! I look forward to your Fall suitcase vignette. My little suitcase came in real handy when I bought it. I was able to carry most everything inside. So it naturally worked for display too. Have fun with your Fall stylings. That autumn vignette is just so pretty against your sofa! Love what you do with boxes and trays!! And a great idea for the Dollar Tree pumpkin! I now will now pass them up because I too thought they were a bit too brassy looking!! Me again.... I forgot to mention that nosey me noticed the beautiful fabric on your sofa...stunning!! AND those sweet pillows!! Lovely!! Your vignette is charming, Carlene...and I love how you changed the pumpkin with paint! Looks wonderful! I am trying to make myself wait before decorating for fall, but your wonderful coffee table vignette isn't helping my self control a bit! You did a great job. Very, very pretty! I still haven't started decorating for Fall; it's in the upper 90's here still and I'm trying to wait but after seeing your pretty table, I think I'm going to get started! How clever! I love how you painted the pumpkin. I will be trying this thanks to you! I saw these little pumpkins at Dollar Tree and passed them up because they were so shiny and fake looking. So, now, I'm going back and hoping they still have some to purchase! You're so clever!